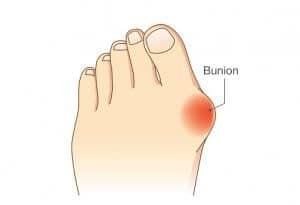 Per the American Podiatric Medical Association, a bunion is a “bump” on the joint at the base of your big toe that forms when bone or tissue at the big toe joint moves out of place. Some are painless while others present discomfort so intense it renders a patient unable to fully enjoy daily activity. Either way, bunions are not only a nuisance, if ignored they will progressively get worse. This month, Beaver Valley Foot Clinic’s Board Certified Podiatrist, Dr. Christina Teimouri, DPM separates fact from fiction by debunking popular myths about bunions. True or False. Only adults and the elderly suffer from bunions.False. While adults and the elderly are more prone to bunions, Podiatrists treat children and teens for bunions every day. And despite the common belief that bunions in children are ultimately related to poor footwear, it’s more commonly associated with genetics than shoes. It’s important to address bunions in children as early as possible so their feet have time to properly grow. If you feel your child has a bunion, seek the help of a Podiatrist as soon as possible. True or False. New shoes may help bunions from hurting worse. True. If you just started to notice a bunion forming or you’ve had one for a while, but aren’t experiencing pain, shop around for a pair of shoes with roomier toe boxes or get fitted for a custom pair of orthotic inserts which will help with arch stability. Though it won’t correct your issue, this may prevent the bunion from getting worse. True or False. If I need surgery, I’ll have to be “put under”.False. If you are not a fan of being put to sleep during surgery a.k.a receiving general anesthesia, you are in luck. In most cases, many bunion surgeries only require local anesthesia and are considered outpatient. This is also a bonus from an insurance perspective because the liability and cost of general anesthesia vs. local is greater. On the other hand, if being awake during such a procedure is not your cup of tea, you can always elect for general anesthesia. True or False. If I’m not in pain, I don’t need to seek bunion treatment. False. Contrary to popular belief, a bunion that doesn’t present much pain can actually cause more damage as it will only continue to grow. Over time, it may affect your ability to engage in regular physical activity, inhibit you from wearing certain shoes and become unsightly. True of False. I’ve heard surgeries are less invasive than they used to be. True. This is a big one for many patients. Even when a bunion presents a negative impact on a person’s daily life, they may be less enthusiastic to address the issue because they’re worried about an extended period of “down” time interfering with work as a result of corrective surgery. Good news! In most cases, and based on the demand of your job, many can return to a sedentary desk job within two weeks of surgery. Your Podiatrist will work with you on a post-operative care plan that is designed specifically for your lifestyle. Providing you follow their advice and there are no unexpected complications, you should be moving around after your bunion treatment in no time! Bunions are one of the most common foot ailments and are often ignored. If you or someone you know are suffering from a bunion, don’t wait any longer. Contact Board Certified Podiatrist Dr. Christina Teimouri, DPM at one of our four Greater Pittsburgh locations today – (878) 313-3338.